Thank you for trying on the Callie DEMO skins from Agenda. There are six skins in this package in two skin tones. These were designed specifically with Caledon residents in mind, capturing features of both Victorian style and some features that address modern resident needs and tastes. Also included is a Body Shape and an Eyebrow shaper. These extras can be used to show what I believe is an optimal face shape for these skins, but feel free to modify them to suit your own preferences. I have also included my best pair of pale blue eyes, gratis. At this time, Agenda Skins and Clothing is not yet open to the public. Our schedule will hopefully allow for a late October opening in the Bad Wolf Bay region. For now, you can buy these skins in Kittiwickshire at the Discovolante shops. They're pretty skins, very classic in appearance. They only come in two skin shades, pale and medium (which I show in the closeups below) and three different makeups. The lips on the skin do not flatter either of my standard shapes lips, so if I was going to wear these I'd have to do another lip shape/lower face shape. The cleavage shading is well done, that's quite necessary for a Victorian Trollop like myself. My personal opinion is that they are worth getting, if the lips flatter your lip shape, and if you like "classicly elegant" skins like I do. I only got the demos because I want to tweak my lips sometime and try them again, and I'm saving my cash for the new Fleur skins coming up next week. 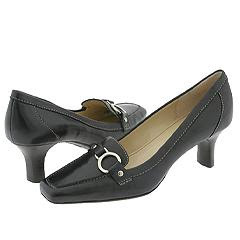 Twas Rosie Bartholomess that made me buy them, they were sooooo cuuuuute on her, that I NEEDED them too. Aren't they adorable. these are the auburn ones but they come in more colors, including traditional panda style. A Tiny Story, you betcha. 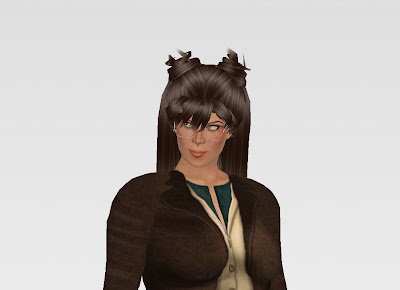 Ya know, there was once this avatar lady in a red jacket and black skirt, her hair was half up and down and she had glasses like Tina Fey. The lady liked to hunt, which in and of itself isn't a bad thing, but the lady liked to hunt from a freebie DX4 Attack helicopter which isn't very sportspersonlike. 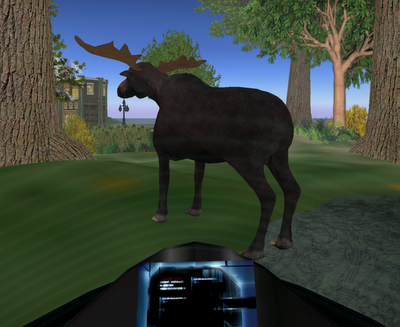 So she was wandering the skies of the grid and she found a Moose in Caledon Tanglewood. Must have been some kind of Maverick Moose to be wandering alone in Caledon. So she preparted to target and bag her a sculpty moose. However, the Lady in the Red Jacket was called away for some other purpose. Probably involving camping for money for a bridge to a Sim named Nowhere. So she turned on the Computerized Artificial Intelligence of her helicopter, telling it to shoot the Moose and then bring it to her later, which would let her talk with the other Joe Sixpack campers about being an outsider. So the un-womanned helicopter moved in and targeted the unaware moose with it's nose cannon. 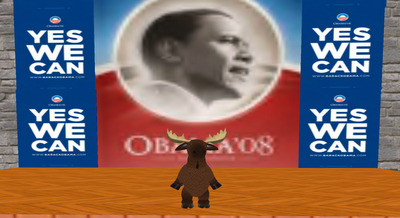 Looks like our Moose-y friend is doomed. But wait, what's this. 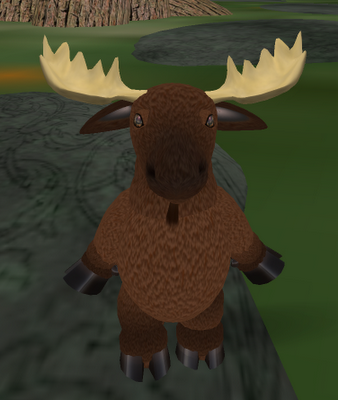 A Tiny defender of Moose shows up, carrying a VERY large weapon. 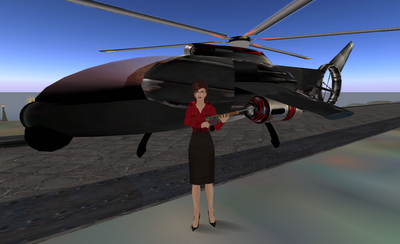 The tiny warrioress readies her weapon and aims at the AI controlled copter. The helicopter is pushed away, thanks to our Tiny Heroine. Hurrah Hurrah. Our Heroine celebrates by giving her support to a certain Senator from Illinois. Fleur Vivant Red Lips 1 skin. It's called a "red" but it's more of a lovely fall burgundy. I has nice contrasting black and gold trimmings on the bodice and skirt, but also comes with a plain unadorned skirt. 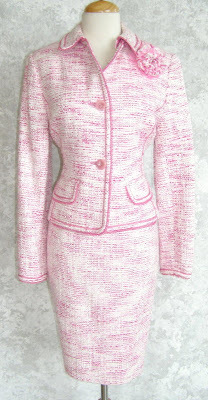 The skirts also come in a slim version, for those who don't want to wear the poofy ball gown skirt. 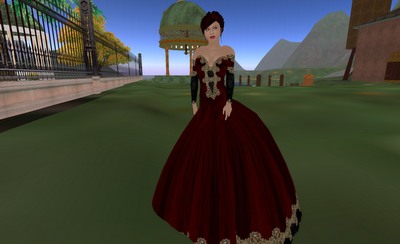 I just think the gown in this color is very flatting on my avatar, and it was well worth buying. ETD Anisa hair and a Fleur skin. 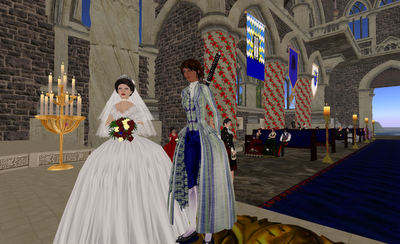 I attended the handfasting of Her Grace Gabrielle Riel of Caledon Carntaigh and Lady Azul Draken. Here's one of the pictures I took. Her Grace Gabrielle Riel was wearing the Flora gown in white from Nicky Ree, and the Gibson Girl hair from Miriel Enfield. Lady Azul Draken was wearing the Lady Edwina ensemble also from Nicky Ree. I am in the first pew on the far left in the burgundyish Evening Star gown from Adam n Eve, ETD Grand hair, and Fleur Vivant Laura skin. The handfasting was probably the "grandest" event I've attended in Caledon and I am glad I was able to attend. My happyest wishes for the future to the happy couple, the Nightingale (Gabi) and the Dragon (Azul) Huzzah! Ball gown shopping for Her Grace's handfasting. We have noted our similar tastes in wardrobe, makeup styles and hair styles so it's part of the "Caledon Mythology" that I'm a distant cousin whose clan of fashionista-warriors sold their lands and titles....to buy more shoes. I happend to mention I was gown shopping and she showed up herself looking for another gown. Caledonian ladies, duchesses or no, can never have too many gowns. I almost didn't recognize her at first. Where's the ETD Anisa and Tiara? Where's the ball gown? zOMG she's wearing....jean capris and....sneakers. Nooooooo. Ah I so kid the Duchess, she does look great casual too. Goes to show you that most avatars have different looks for different occasions. The important thing was not clashing with the Attendants which prevented me from wearing the gown I had been planning on wearing. "Cousin" Gabi's will be in red, and Lady Azul's will be in blue. So I went through my mess of an inventory. Yes.... it's really a mess. a BIG mess. 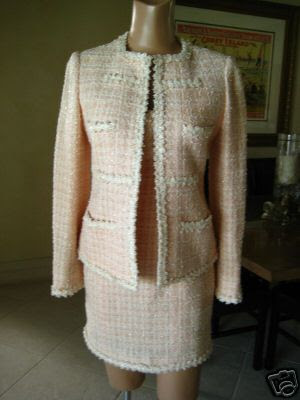 I had nothing that was really telling me that I wanted to wear it to the handfasting. I eventually picked up four gowns, only one of which I have pictures of at the moment, Carrie from Adam n Eve. It's a simple corseted ballgown with a sheer skirt overlay, I got it in black, of course. Yes, I know one is not supposed to wear black, though it's more accepted these days, but I can, because I'm a Victorian Trollop. Simple! Pretty! Love! Good price too and it comes with options so you can wear the corset and stockings lingerie style. I also Looooooove the newest Adam n Eve build in Genesis sim. It is VERY well designed, signs, teleports, it rezzes quickly, it's not laggy, and it's attractive. Now I may not actually wear that gown to the handfasting, I may choose one of the others (though one I will probably save for the Bardhaven Halloween Ball), or just go in Uniform of one of the Caledon Military groups. ( I can do that too.) 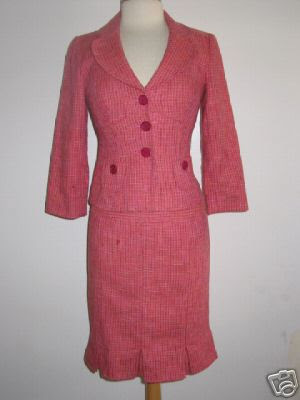 I did need to supplement my collection, though I have gowns that are more "Old Hollywood" in style. I don't have many that said, "Caledon handfasting and reception ball"
Ack ack, bad CCC blog hiatus. Yes, I'm still alive and in SL. It' really is hard to get back in the swing of things, I swear. I login with the intent of doing bloggy stuff but then I get distracted, and NOT with shopping. I have put a few newer pictures on my flickr that I've finally gone pro on. Alaska Metropolitan told me I would go pro eventually. :-) You can see that I "finally" got the ICING Miss Hathaway gown that everyone else has. 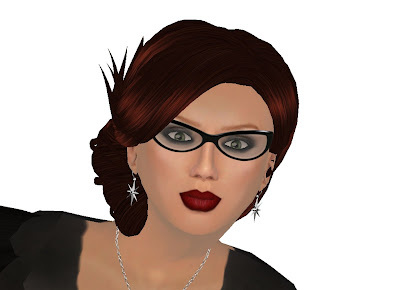 Also, one of my friends in SL has left SL, fellow blogger and redheaded hussy, Kit Meredith. I respect her reasons but I'm going to miss her very much. 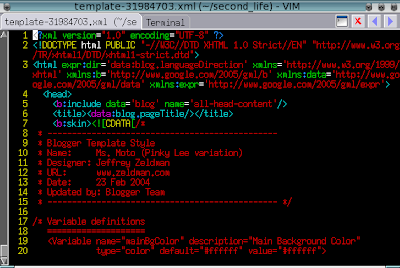 Which, with the ending of Linden Lifestyles, means I am the ranking redheaded shameless hussy on the grid. 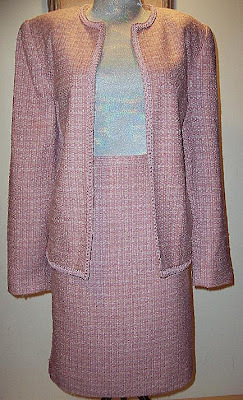 And these days now that I think of it, I am one of the "older" fashionistas on the grid, which is really strange. I really should work harder on doing stuff for Metro Models, writing fashion show scripts (blurbs for outfits) is fun most of the time, unless I'm having writer's block. And on the new machine I could turn down the settings and sit for hours at a fashion show. I've finally figured out how to solve the 11MB high res SL .bmp dump issue, just go ahead and let SL compress them, it'll save em as .png which is not lossy and a lot smaller. I've also been flirting with Miss Hypatia Callisto of Caledon, every chance I get, simply because she says she doesn't get flirted with. There may be a Caledon singles ball scheduled sometime so that we singletons can celebrate our singleness and be cheered on by all and sundry. I also need to take a picture of the bear ears of immeasurable cuteness. Nothing is cuter than me in bear ears, except Rosie Bartholomess in bear ears. My second rezday was last Saturday, same day as the RFL so I didn't plan anything, not that I'm a good planner of parties. I'm still not planning anything, though I do want to throw some kind of party of some kind. If I had parcel control in my skybox area I'd just invite everyone over and set up the parcel stream to Radio Riel or something. I'm glad I kept a blog on my avatar. It's interesting to see how little my avatar has changed over the past few years. I've been reddish haired and TaP/Fleur skinned since late August of 2006. I'm still very classic in style, though I do like to play around with appearance, after all I've been a penguin dressed as Wonder Woman. It's been a fun two years, thanks to the people I've met. SL wouldn't be the same without the people. Alaska, Sabrina, Salome, Daisy, Dot, Kit Maitland, Kit Meredith, Sachi, Rosie, Celebrity, Willow, Luth, Sophrosyne, Vidal, a bajillion Caledonians, and so so many more. As Kit Meredith says on her blog, it's hard to get back in the swing of things. 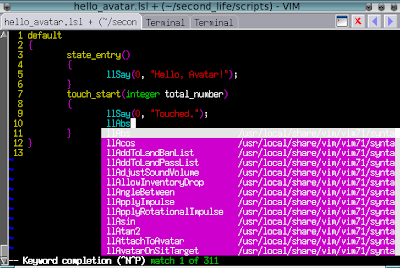 There's never enough time to do what I want in SL and do other things in RL. I've also been trying to figure out a way to streamline photo stuff. On the new laptop SL pics are 11MB, which are teh devil if I want to send a bunch to anyone. Either I can compress them and lose quality or send em as is. 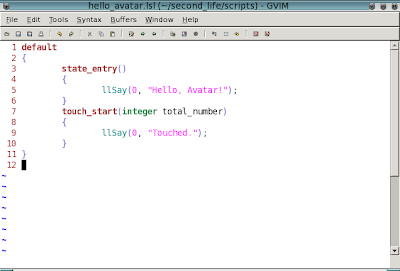 Though one good thing is the new lappie must have the gods own integrated graphics. When I can go to a charity fashion show, have everything rez and take 600MB of pics, and only have SL crash after turning up the graphics after at least 6 hours of SL, that's something. I swear, I should just set up a cron job to auto convert and scale pics I put in a specific directory. Oh yeah I also have another new toy, that I've been wanting for over a year, a mighty Playstation 3. I needed one in addition to wanting one because Midgar (my Playstation 2 with Linux installed) was having hard drive issues. I knew it was going to fail soon, and it did. fscking superblock errors, it refuses to boot at all now, and I never did get all my files off of it. I installed Yellow Dog Linux on the PS3 late night the evening I got it. It runs soooo much better than on the PS2, the GIMP is actually speedy, though it's an older version than what I had on the PS2. I've also discovered that the laptop's LCD screen is crap compared to the cheapo Wal-Mart LCD TV I have the PS3 hooked up to. 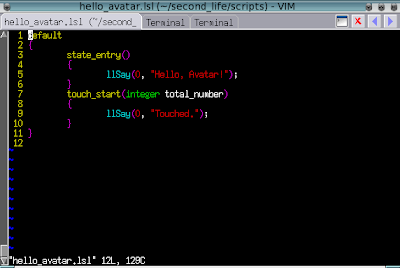 It's contrast and color is not so good and it's even lower resolution. The TV is 1440x900 and the lappie is 1280x800. I'm using 1280x768 under Linux because going higher res causes the TV to try to scale things funny, the PS3's graphics chip is funny about output resolutions too, it only uses specific ones, so I can't force it to go 1440x900. I've been playing Oblivion on the PS3 too, been collecting pretty dresses for my character, a female Imperial with reddish hair. 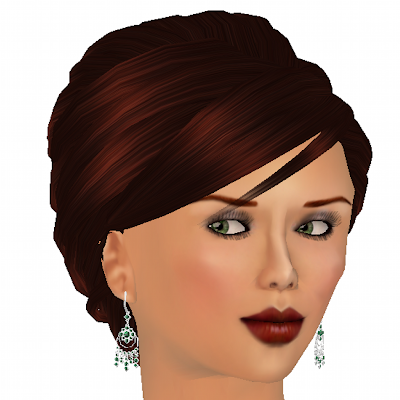 :-) Oblivion's character graphics are "uncanny valley weird", even more so than SL. In some ways I think the game would have been better had the avatars been more "SL" in appearance, less realistic. They eyes on Oblivion characters are spooky. I've been a member of Sony's Gamer Advisory Panel for over 5 years, so I'm hoping I'll get an invite to the "Home" beta. "Home" is sony's SL style virtual environment, that looks suspiciously a LOT like SL. I really want to compare the two. I'm also hoping they allow for user content so Elika can make hair and Roslin and CJ can make makeup for Home. Because I don't want to wander around Home without my ETD Hair in Mahogany or Fleur skin. I've been absent from SL and the blog, I know. I apologize to any readers and fans for that. I had been not feeling up to par, in part due to a bit of the shingles. But I feel more myself these days, thank goodness. Also, the household has a new lappie, still with integrated graphics, but Sl does play better at the settings I normally use, and if I turn the shaders on I can see the pretty clouds and water, and watch my framerate drop to 2fps again. But that would be good for photos I think. The new lappie has Vista...-[continue/cancel], it is annoying, [continue/cancel], I'll probably turn off UAC [continue/cancel]. As for the lappie itself it's a HP DV6809wm AMD 64 bit Turion dual core TL-60, 3GB of RAM, 120 GB of HD (of which about 65 is actually available), NVIDIA 7150M integrated graphics (with hardware T&L, woot!). Aero runs fine, this thing runs Vista better than the old lappie runs XP, so far, mwah ha ha ha.